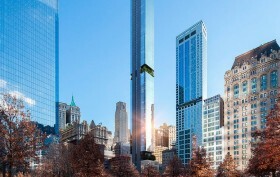 New York City developers have been increasingly competing to seek environment-friendly accreditations based on standards like Passive House, LEED and wellness to distinguish their offerings. Recently “Zero Waste,” defined by the U.S. Zero Waste Business Council as, “achieving over 90% diversion of waste from landfills, incinerators and the environment,” is rising in popularity, with good reason: Certified buildings won’t be generating the mountains of garbage that are the bane of NYC living. 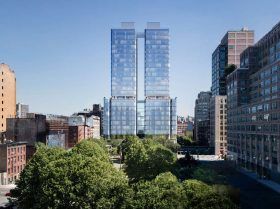 565 Broome Soho, the under-construction condominium tower at the crossroads of Soho, Hudson Square and Tribeca, hopes to be Manhattan’s first Zero Waste-certified residential building, CityRealty reports. 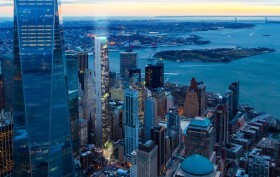 The new mixed-use tower to rise at 125 Greenwich Street will indeed be adding another supertall to the Financial District’s skyline. 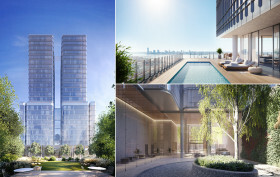 New renderings confirm a final height exceeding 1,000 feet, inching the tower above the the 977-foot 4 World Trade Center nearby at 150 Greenwich Street, according to YIMBY. 6sqft previously reported on the progress of the slender tower-to-be, designed by Rafael Viñoly Architects and developed by a joint venture comprised of Michael Shvo, Bizzi + Partners Development, and Howard Lorber’s Vector Group that will offer a limited collection of condominium residences with unparalleled views of the lower Manhattan skyline and beyond. 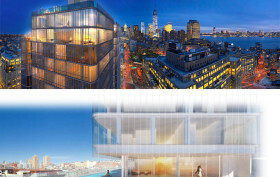 In January, 6sqft unveiled a set of illustrations and drawings detailing the exterior of Renzo Piano’s forthcoming condominium tower 565 Broome Street (formerly known as 555 Broome). Now, with construction finally underway, the investors at Cindat Capital Management have published an online gallery providing a better taste of what’s to come. 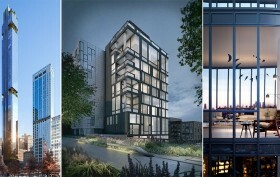 Pitched between two of the city’s most coveted neighborhoods, Soho and Tribeca, the much-anticipated development will rise nearly 320 feet in height along a full Varick Street block front between Broome and Watts Streets. The 25-story structure is being propelled forward by a joint venture among Bizzi & Partners Development, Michael Shvo and Itzhaki Acquisitions. Pritzker Prize-winning architect Renzo Piano was tapped as the design architect, while the local talents at SLCE are serving as the architects of record.